A captured P.O.W. commando codenamed Snake (Bart in the NES version) must bomb his way out of a P.O.W. prison cell and escape. During gameplay, the player must fight through four levels where the mission is not only to escape, but to infiltrate the enemy base and destroy their leaders. There are brass-knuckles, body armor, knives, grenades, and machine guns that the players can use in order to aid them in their mission. P.O.W. is a side-scrolling, beat 'em up game. The gameplay is simple - punch, fire equipped weapons, and pistol whip the enemy while moving through the levels. When both buttons are pressed simultaneously, the player unleashes a powerful flying kick. The arcade version has an occasional glitch in the fourth level (at the point at which the player is facing the boss of that level) in which an enemy soldier will roll indefinitely and cannot be killed, thus making it impossible to progress further. Source: Wikipedia, "P.O.W. 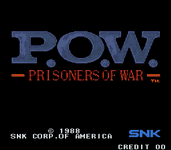 : Prisoners of War", available under the CC-BY-SA License.